My three year old daughter wears little orthotic braces to help give her stability and I am often asked what they are and why she has them. It must first be stated that Darah has the cutest feet in the entire world! She has little short sausage toes and these wide, fat, squishy feet that anyone would want to “This little piggie went to market” at! She also has a sweet little sandle toe gap between her first and second little sausage toes. Ok, I’ll stop gushing about how stinking cute her feet are now and get back to the orthotics. Darah’s ankles pronate; meaning when she stands up, they roll inward. Here’s a picture of how they roll inward while she stands. The weight is distributed in an awkward way and longterm side effects of this can be hip and back problems. Try it! Stand up and roll your ankles inward. Can you feel awkward pressure all the way up to your knees and hips? This problem is not limited to children with Down syndrome, however a lot of children with Down syndrome have this problem because they commonly also have hypotonia and looser joints. Orthotics and shoe inserts can really help a person with ankle pronation. There are different types of orthotics. Some give more support, others give less support. My daughter has Sure Step Orthotics. These are specifically made for children who have ankle pronation or have an unbalanced or uncoordinated gait which is causing them to be delayed in their gross motor development. They are made from a very flexible plastic and are lightly cushioned. The plastic covers the bottom of her foot (stopping right before her toes) and covers the backs and sides of her lower ankles. When she wears converse style tennis shoes, they are completely hidden. Darah walks so much better when she is wearing them. She has to wear socks under them at all times, and cannot wear them without shoes over them (because they are slippy), so the con to orthotics is the sweaty feet they produce during the summer time. She wears them whenever she leaves the house. I let her have barefoot play at home. She will not necessarily wear these for forever, however she may need some sort of shoe insert or arch support for the rest of her life due to the severity of her pronation. This equipment is covered by our insurance. They also come in very fun patterns! Here’s a good article by Pat Winders (the Physical Therapy God in the Down syndrome world) on gross motor development for children with Down syndrome. Let me know if you have any questions about our experience with Darah’s orthotics! I will be happy to share any other information I have (or can dig up) for you! Also, please share your experiences with your child’s orthotics! Our readers would love to hear your stories as well! Great post McKenna! Thanks for sharing your experience. Darah is so cute in that photo! 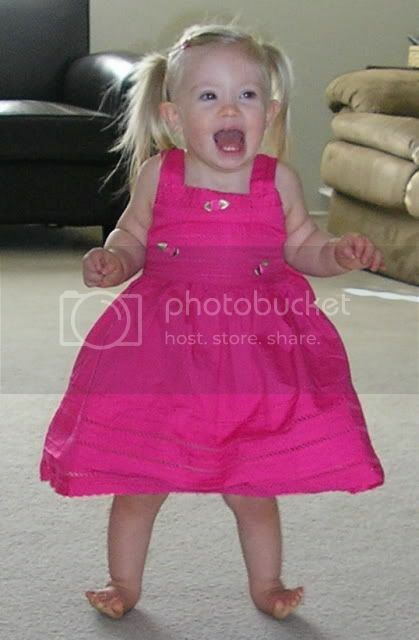 That is such a CUTE picture of Darah!! Seriously – that picture is too cute. Darah asked me to thank you for her. Hi, I was wondering if you could tell me a little more about how everything is going with her orthotics now. My daughter will be going in soon to be evaluated for the sure steps and I would love to hear more about them. They are working great. She was refitted for a larger size this summer. We were a little lazy with them in the summer time, but now that it is becoming closed toed shoe weather again, we are more consistent. I don’t know how long she’ll need them, but not for forever. I imagine we’ll use some sort of shoe insert when she doesn’t need this much support. She has pretty low muscle tone and is much more stable when wearing her orthotics, so I am glad we have them!! Good luck to both of you! I happened upon your site, and wanted to introduce you to an over-the-counter arch support for children. I would love to send you a sample for your daughter if you feel they may help her. Please visit our site, and let me know if you would like a sample. BTW – I love your name – it is my godchild’s and I think it is beautiful! Darah’s feet and ankles look like my Elise’s! She got her first set of Sure Step orthotics (the same ones as Darah’s) before she could even walk, so that she could learn to balance better and learn to stand. She has gone through I think 5 or 6 pairs of them now and I think they are working just like they said they would. Yes, they are a pain to put on every day and she can’t wear the cute shoes that I’d like her to, but they are definitely worth it because she needs them. She does go without them at home and some days that we are out & about without doing a lot of walking. Not everyone is the same, but her feet & ankles still pronate without the braces so she’ll be wearing them as long as she puts up with them. We live in the same town that Sure Steps is headquartered in (South Bend, IN) and I just love them (Midwest Orthotics). We’ve only had good experiences there and the people are great, esp bernie, the orthotist who invented Sure Steps. They will make the orthotics with any character you’d like – or you can try a solid color, like we did this last time. It’s a solid medium pink and they go with everything. I am so glad I stumbled upon your blog! I have a daughter that is 20 mos and just got her first pair of Sure Steps yesterday. She hasn’t worn them yet because I am having a hard time finding shoes that work with them. I saw you mentioned Converse, what other types of shoes have you found that are wide enough? Thanks so much for the help!! Hi! Our son got his Sure Steps today, and I’m wondering if you have found any sandals that fit with them? We have some Stride Rite sandals, but they don’t fit over them. Our orthotist said Nike sneakers. But I’d love to find sandals so his feet aren’t so hot this summer! Thanks! Angel, I could never find sandals to work. I thought about getting velcro and making the sandal straps longer, but ended up never trying that. 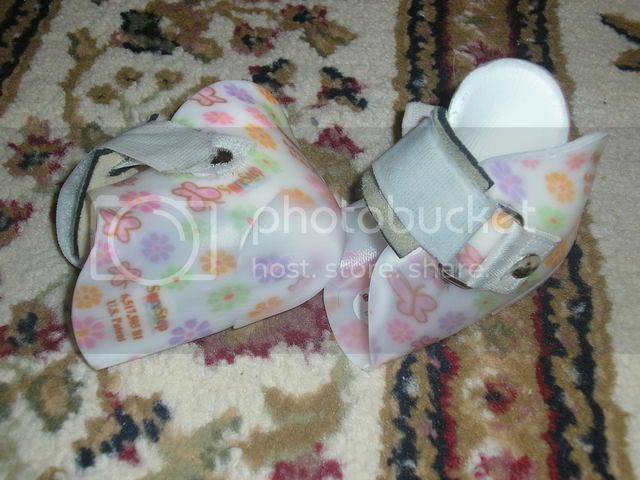 Some people have told me that crocs work with the sure steps…maybe you can try those! Hi there, my sister found your site when googling Sure Step. My 2 year old just got fitted for them today. He is delayed in his walking and has pronation. I wanted to say thanks for the wonderful explanation and the hope that this will help him! Hi! I want to thank you so your explanation about these. We just took our daughter today to a new PT to see if there was anything else we need to be doing. She suggested Sure Steps. I was a little worried about them just because my daughter HATES shoes! (I think she got that from her momma because I HATE shoes too! haha) We will go next week to get them. My husband and I were just talking today about what shoes to get and we found some cute converse shoes and wondered if they would work. Thanks for letting me know they will!! I was also told by someone that New Balance will to because they are wider. You little girl is just too cute!! Chloe’s ankles don’t turn in as much as Darah but I have noticed that they do so she stands on her toes a lot. Hopefully these work and she doesnt fight me when putting them on. Her twin brother doesnt have to wear them but we do need to get him a good pair of shoes with good arch support. Thank you for posting. I was wondering what shoes you put over the orthotics. My daughter is 2 with Down Syndrome and is wearing the Sure Steps, but as you mentioned they are slippery so you need to wear sneakers or other shoes on top. Any ideas?